This week, the City of El Cajon launched a campaign calling for Real change, not spare change. The campaign encourages the public to contribute in meaningful ways to help homeless individuals rather than contributing to panhandling. 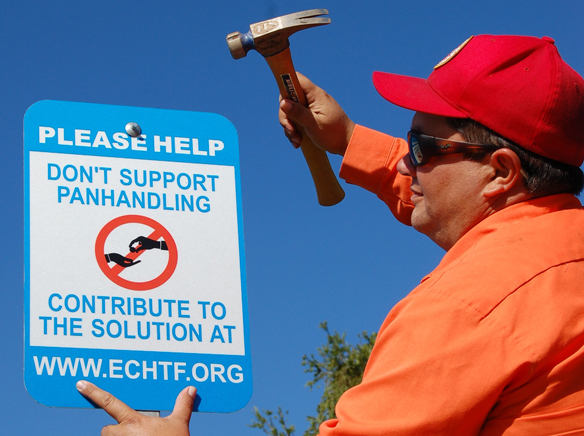 The City has already begun installing signs around El Cajon that encourage donating to homeless service providers rather than panhandlers. In addition, the East County Chamber of Commerce will distribute posters for businesses to display that discourage contributing to panhandlers. Panhandling has a very real impact on El Cajon. It hurts local businesses and jeopardizes the safety of well-intentioned donors (both pedestrians and motorists) as well as panhandlers. Experts have stated that providing spare change to panhandlers does not help those in need. In fact, in many cases, contributing to panhandlers only fuels their addiction or impedes them from seeking help. The East County Homeless Task Force, the East County Chamber of Commerce, the City of El Cajon, and other homeless advocacy groups believe the same. The City advocates for a more effective way to help the homeless rather than giving spare change to panhandlers. To help, residents are encouraged to visit the East County Homeless Task Force’s website at www.ECHTF.org. $70,000 to fund a housing navigator position with Crisis House that will help homeless individuals find housing; and, $80,000 for rental assistance vouchers. For more information, visit the City’s website at www.cityofelcajon.us.